The Giants aren’t letting Corey Coleman get away. On Thursday, the G-Men applied the original round tender to the former first-round wide receiver, Ian Rapoport of NFL.com tweets. Because Coleman was a first-round selection, another team would have to give the Giants a first-round pick in order to sign Coleman and nullify his one-year, $2.03MM offer sheet. Needless to say, no team will be willing to pay that price for the Baylor product. The Browns made Coleman a first-round pick in 2016, but he didn’t do a whole lot at the NFL level. As a rookie, he recorded 33 catches for 413 yards and three touchdowns, all of which still stand as career highs. After bouncing around with the Bills and Patriots, he hooked on with the Giants’ practice squad in October. He was quickly promoted to the varsity squad and recorded five catches for 71 yards across eight games. Coleman also averaged 26 yards on his 23 kickoff returns last year, so he figures to have a role on special teams in 2019. The Giants promoted wide receiver Corey Coleman from the practice squad on Thursday morning. Coleman will take the roster spot left by the trade of defensive tackle Damon Harrison to the Lions. In the last three months, Coleman has moved between four different NFL teams. After being traded by the Browns and going through a pair of uneventful stints with the Bills and Patriots, Coleman is itching to prove himself. The Giants recently lost Cody Latimer to injury, and the club could be without Russell Shepard and Jawill Davis this week. Although he had much time to learn the playbook, Coleman could have a chance to see the field this Sunday when the Giants face the Redskins. Coleman, the No. 15 overall pick in the 2016 draft, has yet to outperform his modest rookie season. In that year, he had 33 receptions for 413 yards and three touchdowns. In 2017, he had just 23 catches for 305 yards with 2 TDs, and he’s still waiting to make his 2018 debut. The Giants signed wide receiver Corey Coleman to the practice squad, a source tells Dan Duggan of The Athletic (on Twitter). Coleman worked out for the Giants on Wednesday and agreed to join the reserve team on Thursday morning. Coleman will offer the Giants some extra insurance after the club lost Cody Latimer to injury. Bennie Fowler was signed to the main roster this week to fill in for his fellow ex-Bronco, but Coleman will be kept nearby if the Giants want to make any more tweaks to the receiver group. The deal marks Coleman’s fourth team of 2018. The former first-round pick couldn’t catch on with the Bills after being shipped over by the Browns, and he didn’t make much of an impression on the Patriots, but he hopes to have an easier path to the field with the G-Men. 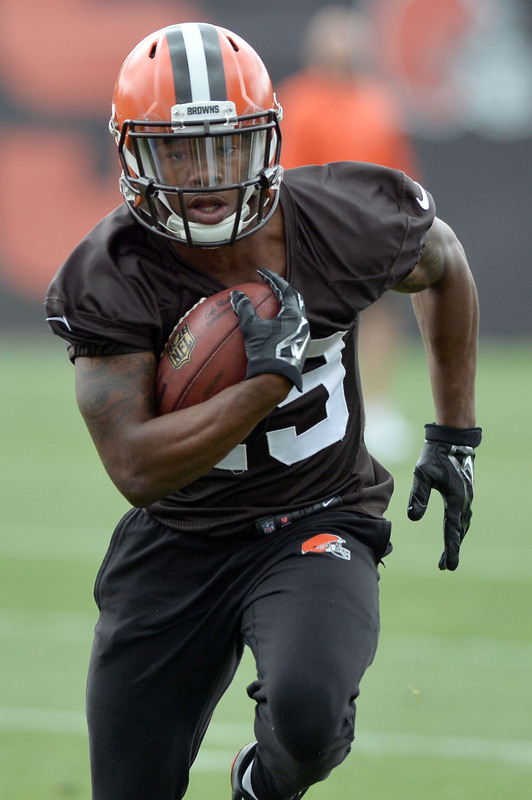 Former Browns first-round pick Corey Coleman worked out for the Giants on Wednesday, Field Yates of ESPN.com tweets. Both New York teams have looked at the wide receiver this week, so his next stop could very well be in New Jersey. The Giants were forced to place No. 3 wide receiver Cody Latimer on IR this week, so they could use some reinforcements for the passing game. Bennie Fowler was brought aboard to take his place, but someone like Coleman may offer greater upside. Granted, Coleman hasn’t done a whole lot since since being selected with the No. 15 overall pick in the 2016 draft. The Browns traded him for a 2020 seventh-round pick in August, but cut him in the first weekend of September. After that, the Patriots added him, dropped him, and signed him to the practice squad before dropping him from the reserve unit on Sept. 29. Coleman’s rookie season was his best to date, a campaign in which he caught 33 passes for 413 yards and three touchdowns. Last year, he had just 23 catches for 305 yards and 2 TDs. The Jets will work out free agent wide receiver Corey Coleman, a source tells Field Yates of ESPN.com (on Twitter). Coleman will audition alongside Rishard Matthews in hopes of finding a new NFL home. If signed, this will mark Coleman’s third stop in the AFC East after he had brief stints with the Bills and Patriots. He wasn’t a fit for Buffalo’s main roster or New England’s taxi squad, but it’s possible that he could shine in New York given the team’s lack of healthy WR options. The Browns made Coleman the No. 15 overall pick in 2016, but he has yet to do much at the pro level despite his immense potential. His rookie season was his best to date, a campaign in which he caught 33 passes for 413 yards and three touchdowns. Last year, he had just 23 catches for 305 yards and 2 TDs. The Jets are riding high after topping the Colts in a shootout on Sunday, but they’ll need some more ammo in advance of this weekend’s contest against the Vikings. Quincy Enunwa, Terrelle Pryor, and Charone Peake are all banged up, leaving Robby Anderson, Andre Robbers, and Jermaine Kearse as the last receivers standing. Corey Coleman‘s stock has plummeted considerably over the past two months. 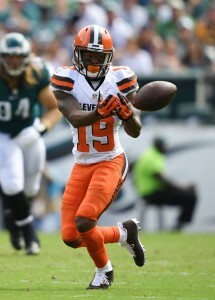 The 2016 first-round pick had already gone from the Browns’ wide receiver rotation to being traded for a seventh-round pick to ending up on a practice squad. Now, the Patriots are cutting the third-year wideout from their 10-man practice squad, Field Yates of ESPN.com reports (on Twitter). 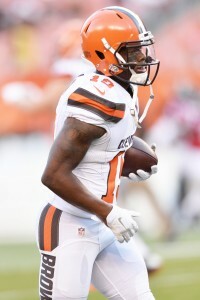 Coleman wound up on New England’s taxi squad after the Pats cut him from their active roster to make room for his former Browns teammate, Josh Gordon. Coleman did not play in a game for the Patriots this season and is now unattached again. This marks the third team to jettison 2016’s first receiver drafted. The Bills waived Coleman soon after trading for him. The Baylor product started eight games for the 2017 Browns but managed only 305 receiving yards after showing some promise early in his rookie season. The Patriots have signed wide receiver Corey Coleman to their practice squad, according to Ian Rapoport of NFL.com (Twitter link). 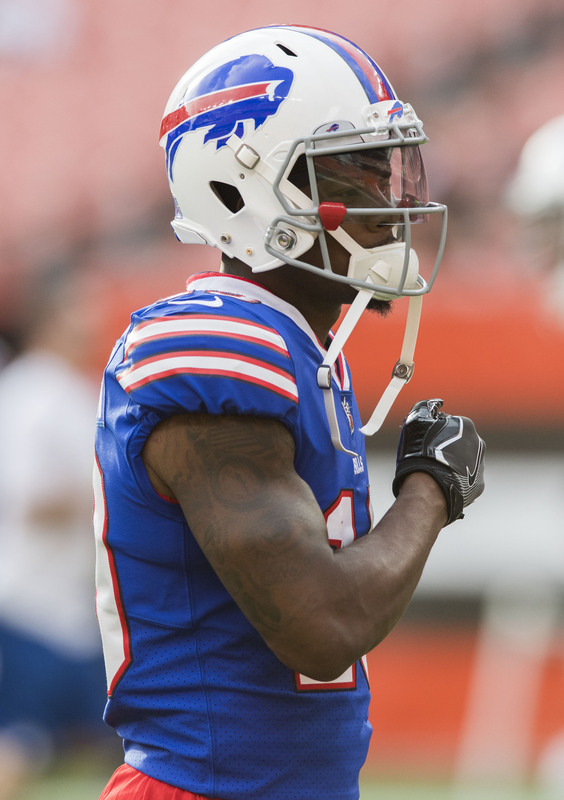 New England originally signed Coleman to its 53-man roster earlier this month, but he was cut when the Patriots acquired another former Brown — the mercurial Josh Gordon — via trade on Monday. Given that he’s only accrued two NFL seasons, Coleman still has practice squad eligibility, and will be given the opportunity to develop with the Patriots in practice and in meetings. Given the Patriots’ unsettled wide receiver depth chart, Coleman could still conceivably work his way back onto their active roster this season. With Julian Edelman suspended for two more games, New England’s list of pass-catchers includes only Chris Hogan, Gordon, Phillip Dorsett, and Cordarrelle Patterson (excluding special-teamer Matthew Slater). Coleman, the 15th overall pick in the 2016 draft, didn’t produce during his two seasons with the Browns, but that was partly due his suffering a broken hand in each campaign. Cleveland moved on Coleman earlier this year, trading him to the Bills for a 2020 seventh-round pick, but Buffalo waived him before the regular season got underway.